The Memorial Poem Pet Urns are solid wood pet cremation urns for dogs and cats that include a poem of your choice along with your pets name and dates, and pawprints (cat or dog) which will all be laser engraved permanently into the urn's surface. 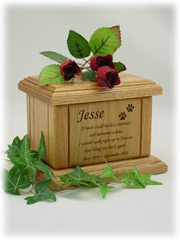 The Memorial Poem Pet Urn is a select grade hardwood pet cremation urn. Cremains are loaded through the bottom. The 4 available poems for your choice are: If Tears Could Build A Stairway, Losing You, Forever In My Heart or Never Forget. Poem will be shown upon choice made. Inside Dimensions: 4" x 2 1/2" x 3 1/4"
Outside Dimensions: 6 5/8" x 5 1/8" x 4 3/4"